Though the NatCroMo CAL has done, i still have to finish my cardigan. I got a bit sidetracked by the Russian crochet and some knitting, but now i have finished another little scrumble. 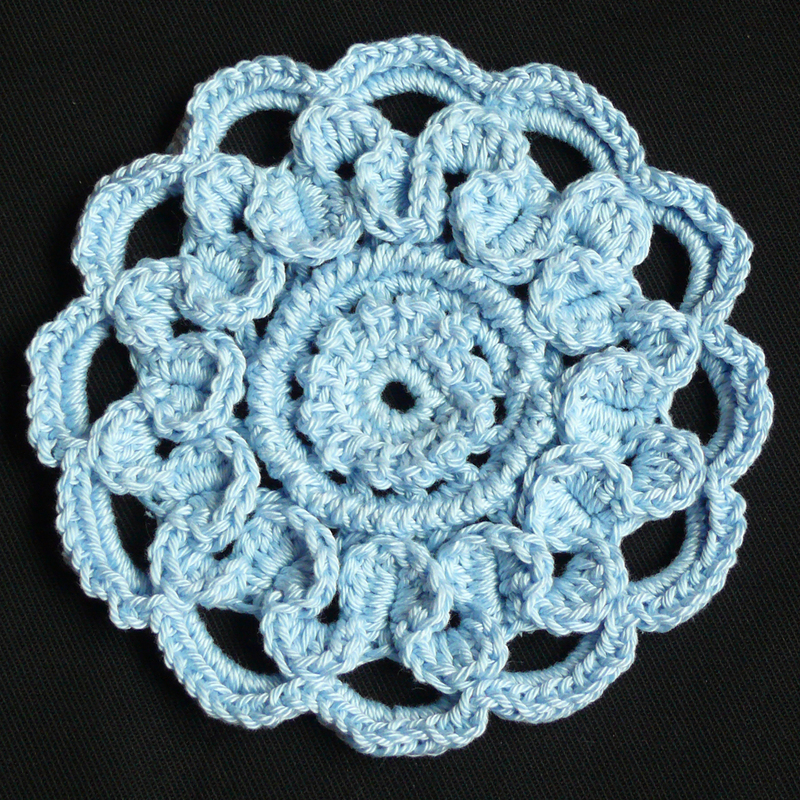 It is based on the crocodile stitch, with some crab stitch and picot rounds. The crab stitch is crocheted on the front loop of the underlying round. The next round is crocheted on the back loop of the previous round. In the crocodile stitch the base round exists of 2 chain, 1 double crochet, 2 chain, 2 double crochet. The 'leaves' of the stitch are crocheted around the 2 double crochet. My alteration is on the base round 2 chain, 2 double crochet repeated, after closing the round with a slipstitch, crochet 1 single crochet, 1 half double crochet, 3 double crochet, 1 half double crochet, 1 single crochet around the 2 chain loop, go down the next double crochet with 1 single crochet, 1 half double crochet, 3 double crochet, up the next double crochet with 3 double crochet, 1 half double crochet, 1 single crochet. Repeat the round like this. Leuk geslaagd! De kreeftsteek ken ik wel dus dat herken ik ook maar de krokodillensteek is vooralsnog chinees. Die ga ik eens oefenen en dan snap ik misschien ook wat je geschreven hebt!